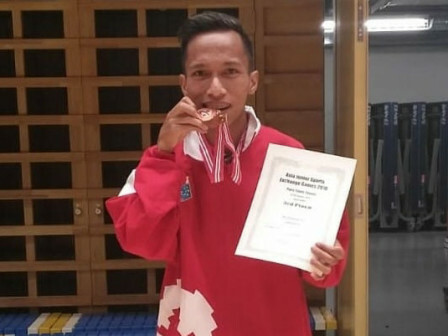 Para table tennis athlete from Jakarta, Kusnanto, won 3rd place in The Asia Junior Sports Exchange 2018 which is held in Tokyo, Japan.
" We should be proud with this achievement"
Delegation team leader, Sumartono mentioned Kusnanto managed to defeat host athlete from Tokyo with score 3-1. "We should be proud with this achievement," he stated, through his written statement from Tokyo, Sunday (8/26). In group, he continued, Kusnanto managed to defeat other para table tennis athletes from Yangon, Manila, and Beijing with score 3-0. While entering knock out round, he also defeated Seoul and Hongkong athletes with score 3-0. "He failed to reach final round because he lost to Bangkok athlete with score 2-3," informed Sumartono who also acts as Jakarta KDH KLN Bureau's Event Division Head. Meanwhile, Kusnanto expressed how happy he is to be able to perform in The Asia Junior Sports Exchange and won the 3rd place. "This competition is a part of my preparation to perform in Asian Para Games 2018 that will be held in Jakarta," he explained. For information, Jakarta also sent six other athletes for table tennis. Those are Nandra Chairunisa, Rafanael Nikolan Niman, Tedy Fendra, Waldner, Arimbi Kinanti, and Dista Puspita. The Asia Junior Sports Exchange 2018 is participated by 18 Asian countries to gain sport achievements and strengthen relationship between countries.